The boys at Camp Quinebarge come back every year because of the great atmosphere the camp provides for its males. Whether it’s camping out in Monkeytown as a cabin or its flying down our zipline, boys love Camp Quinebarge. 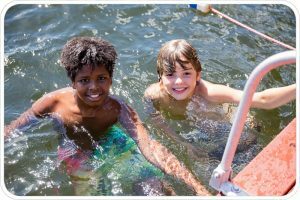 Camp Q consistently gets feedback from the male campers that they enjoy our sports programs, adventure program, boating, and hiking programs the most. We also offer nature, horseback riding, and ceramics. 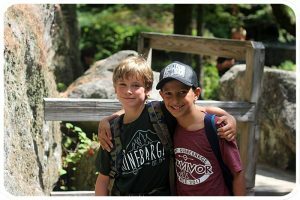 Campers say that these programs and the friendships that they make at Camp make Camp Quinebarge the best camp for boys in New Hampshire. 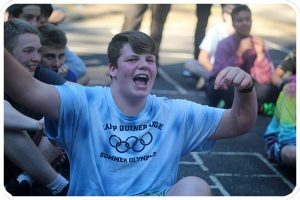 When playing sports at Camp Q there is only one goal and that goal is to have fun. There is some instruction in our sports program but boys love that Camp Q lets them play games and all types of games. 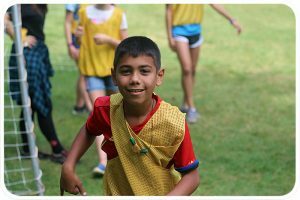 From soccer to capture the flag, there is a sport for all our boys at Camp Q. If that’s not enough, archery and tennis are offered every period for our campers. Our low ropes Adventure Program at Camp Q promotes teamwork among our male campers to work together to accomplish challenges. The directors of Camp Q have cabins do these challenges early because they find that the boys really bond in working together. Nightly candle pass – a cabin chat lit by LED candle – allows boys to reflect on their experiences as a group, solidifying the friendships and bonds made during the day. Every session at Camp Q each cabin will have a camp out in Monkeytown. This includes tents, s’mores, and ghost stories all around a campfire fire (campfire fire is a thing at Camp Q). They boys find that these nights are the most memorable and fun nights that Camp Q has to offer.